After a long weekend fishing and picking in the hills of East Tennessee, I finally got an opportunity to get back out on the Bay for a few minutes this morning. It was a little tough to get up when the clock went off because we were out late last night in Annapolis. My son Daniel was in town performing with the Lovell Sisters at Rams Head. If you haven’t caught up with this band yet, you might want to – three gorgeous sisters from North Georgia who can flat out play and sing. They’re just coming off a stellar festival season and two recent appearances on the Grand Ole Opry. They’re on a short run through Phily and NYC, stopping at Annapolis last night then on to Roanoke tonight. That left us about two and a half hours this morning to fish. Daniel and I were joined this morning by Rebecca Lo vell. Rebecca plays mandolin and handles most of the singing and a lot of the songwriting for the band. She’s one of the most talented young ladies I’ve ever met. She also showed some pretty good chops with a rod & reel this morning. We launched at Mattapeake before daylight into a stiff 15 knot west wind. Instead of working the east side as usual, I decided to start west in the lee of Sandy Point. 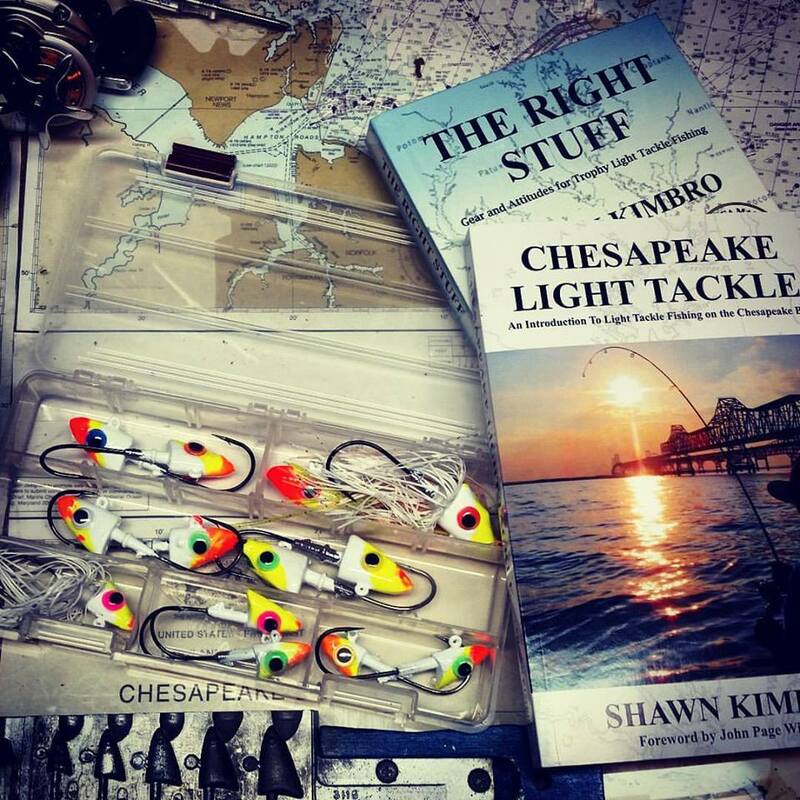 It took us about an hour to identify the pattern, but we eventually started turning up some decent fish that were holding tight to the pilings in shallow water. 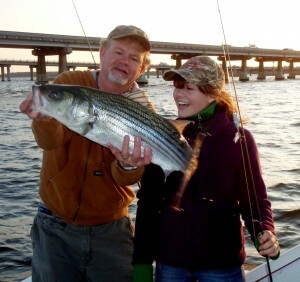 Here’s Rebecca hooked up with a nice striper. She landed it fine, but I couldn’t get her to hold it! Daniel was plucking an upright bass at Rams Head last night, but thumping striped bass this morning. I sometimes joke that, when he was young, I told him I wanted him to grow up and make his living catching bass. He misunderstood! Here he is with a nice fish. He lost a very good one to the pilings. I think we had four fish over 30 inches with some more in the mid and high 20s. The fish were spread out, not relating to any one piling or area, just here and there. We never got more than one or two fish at any one location. Sometimes we went 15 or 20 minutes between strikes. Hot lures were 6 inch hotrodded soft plastics with three quarter or one ounce jig heads. We were always casting into the current. The lure had to touch the bottom on every jig and a cast at a 45 degree angle to the outgoing current, but still close to the piling, was more productive than one jigged straight downstream. Rebecca threw a spoon for a while. There are still some blues around to contend with. Water temperatures are in the low 70s and falling due to the unsettled weather I was hoping for last week. We packed up and headed off the water at 8:30 AM so the band could get back on the road and I could get to work. Fun fishing. The pics of you & Daniel with your fish are impressive, but you two catch’em all the time! I am most impressed with your writing & Rebecca’s fish catching abilities!! I need another shot….I wasn’t dialed in….I was tired….my head wasn’t in the game…I CAN’T SLEEP BECAUSE OF THAT DAMN FISH!!!! Sorry. I feel better now. One of those things. Those fish will be around for a while, hit ’em again good today on the outgoing and also lost another good fish. Hard to land them in the pilings and shallow water. Lose em and forget em. Or they’ll haunt you forever. Good fish tho it looks like. Sounds fun.